I noticed a very interesting announcement today from Pegasus. For those that don’t know them, Pegasus are a leader in hotel distribution to hotels, serving around 100,000 properties around the world. For this reason, I’m always keen to hear what tools they are developing for hotels to improve their distribution strategies. 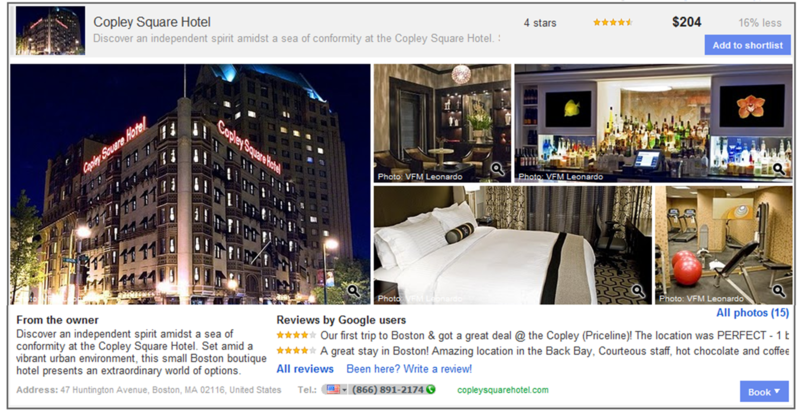 Today, Pegasus communicated that one of their divisions, Open Hospitality, is now offering Google Hotel Price Ads (HPA) to hotels following a successful pilot with more than 50 hotels. Those hotels using Open Hospitality reservation and booking services can opt to drive traffic from search results in Google Search, Google Maps, Google Places and the Google Hotel Finder directly to the brand website to increase more profitable direct bookings. Leveraging existing reservation and booking products and services, Open Hospitality can serve real-time pricing through Google searches for participating clients, allowing bookers to be redirected to the hotel website for booking. 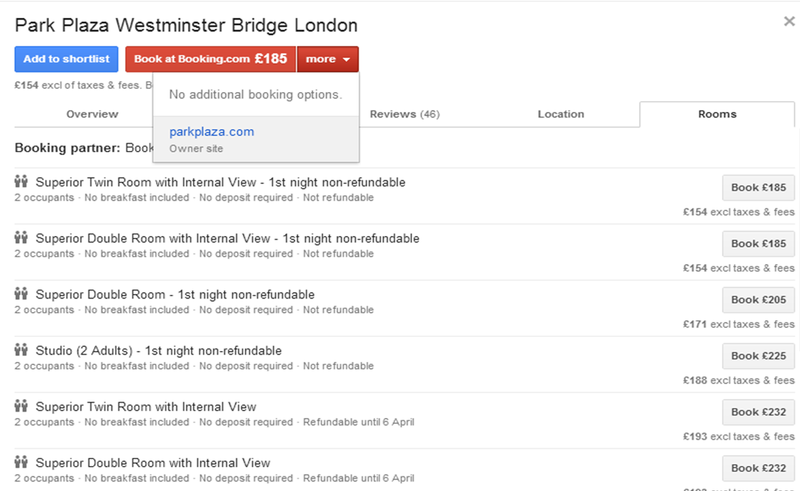 Google Hotel Price Ads accommodates customers who prefer to book hotels directly with the hotel, sending online shoppers directly to the brand website. In addition to creating opportunity for more profitable direct bookings, this has the added benefit of allowing hotels to sell ancillary products, such as dining, spa services, events or other amenities in the booking process. Mirroring the airline ancillary business which is starting to grow considerable seems to be a natural step for some hotel chains. Of course, driving traffic direct to you own brand website is a critical aim of any distribution strategy you have. This is where you make the most money – no costs to OTA’s or third parties – and it also allows you to control your pricing and brand identify more clearly. We talk a lot about ways to do this, and certainly this new offering from Pegasus provided a different approach to try to drive traffic. 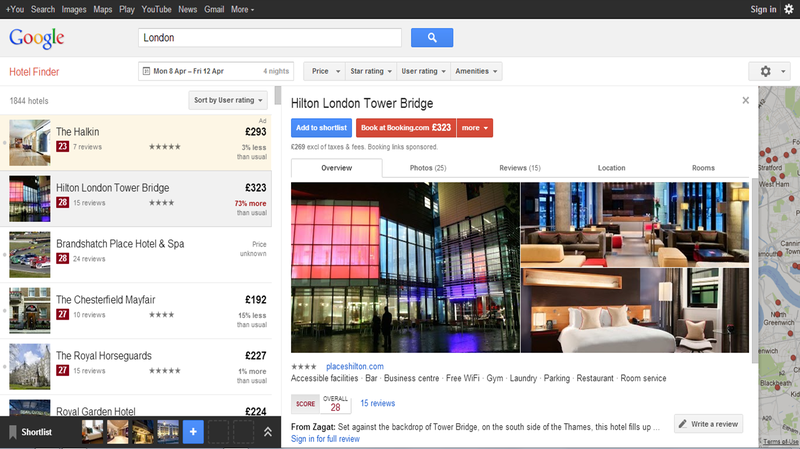 A short video from REVPAR GURU’s Vice President – Bruno Perez on Google Hotel Finder. He’s right – add a search button – job done – and the hotel industry changes overnight. I’d like to hear more from this guy, and I’ll share anything else I find on the topic (there is another post planned to follow-up from the last). 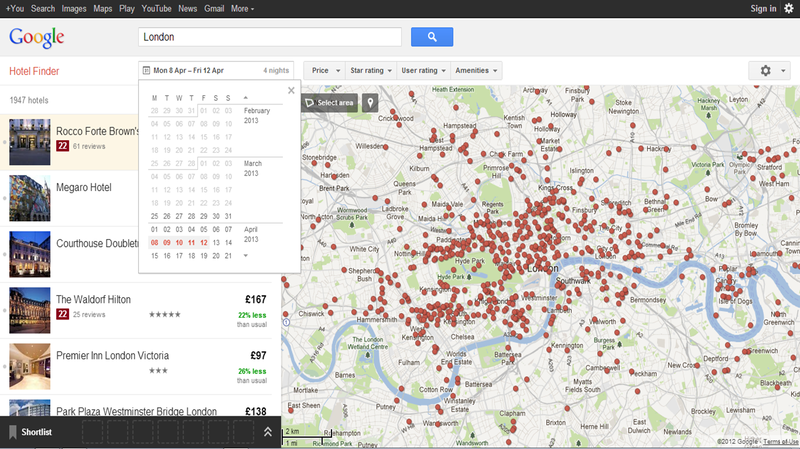 I’ve been looking at the new Google Hotel Finder over the last week and have to say I’m pretty impressed on a number of levels. For those of you that have not heard of this, it’s the latest in a long line of new products from Google, who appear to be taking over the world (if they haven’t already). 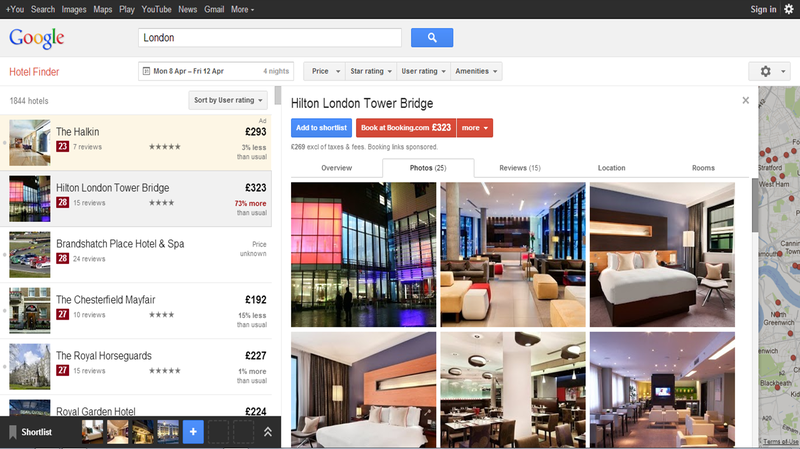 Google Hotel Finder is Google’s first real bite at the travel industry, and with a simple idea and using their existing technology, they’ve made a good start. 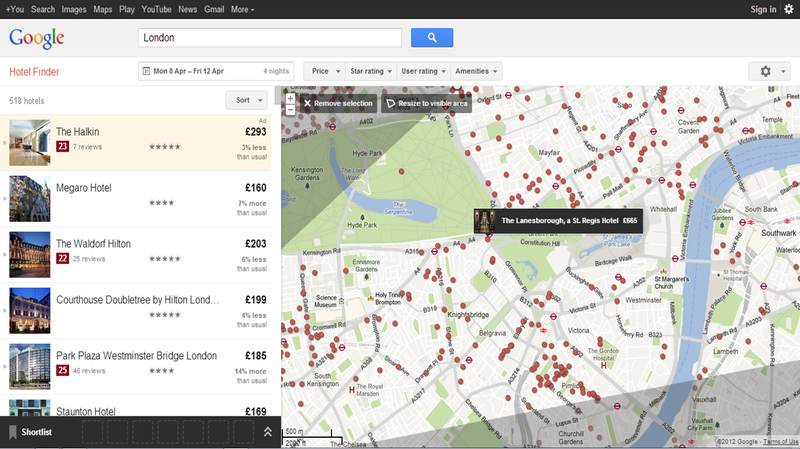 Currently in “experiment” mode, Google hotel Finder is a simple idea. 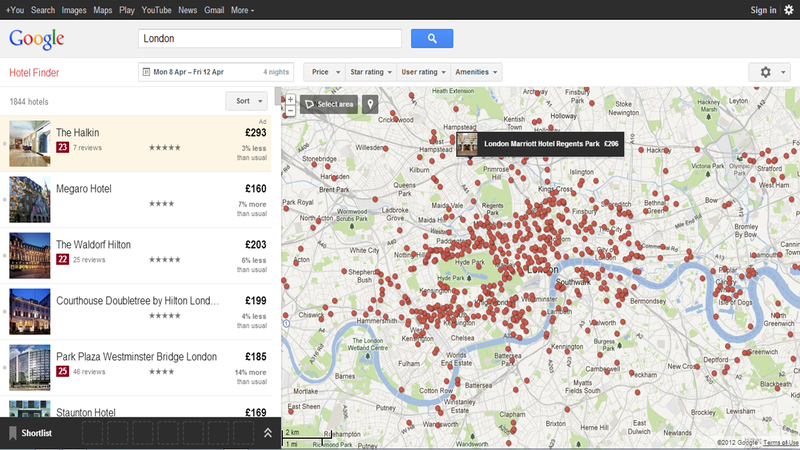 Add a location and dates, and browse for your perfect hotel based around Google Maps. 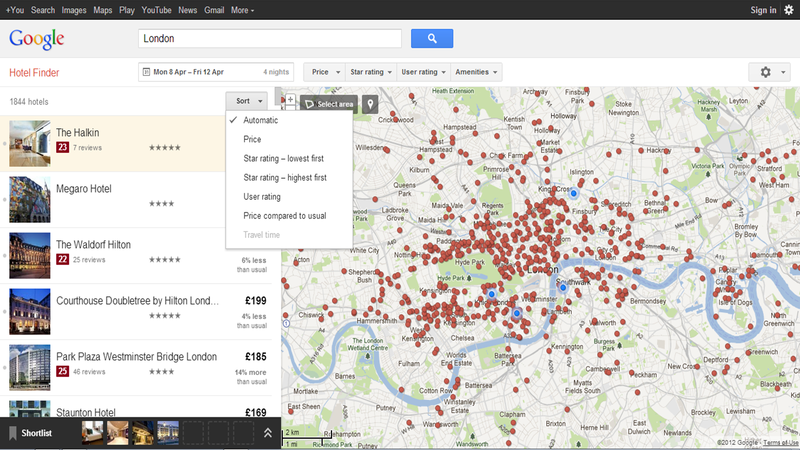 You can also add price preferences, start and user ratings to narrow your search. Simple! The “experiment” is only available for USA hotels but you can see the appeal of searching for a hotel in this way – something that isn’t widely used amongst online travel agencies. Some of the tech companies do use map searches of course, as well as some of the GDS, but not to this scale. 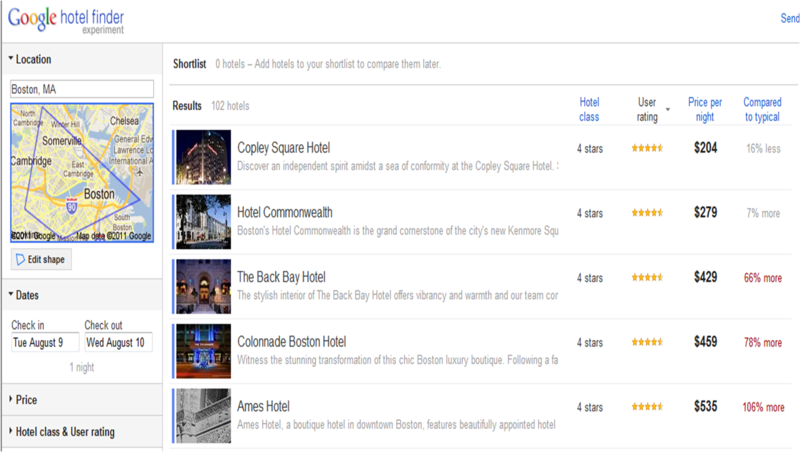 If you leave your search open, results are displayed in a listing view with a thumbnail photo, with hotel class, user rating, price per night and a fourth column which details the typical saving from a published rate. 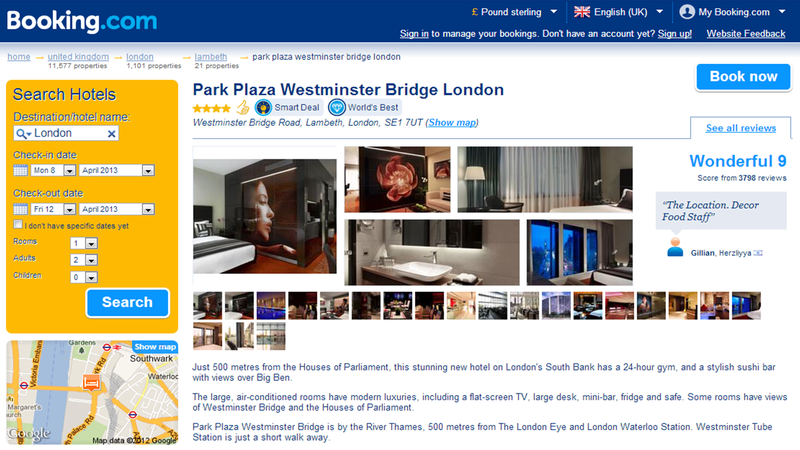 Good Hotel Finder comes into its own when you click on a property, and are greeted with a great hotel profile display. Images are returned from VFM Leonardo as you would probably expect, and Google have done a good job in bringing this page together. The shopping part works well with Google, so when you come to book, your directed to a range of supplier websites, such as Booking.com, Travelocity, Hotels.com, Priceline and the actual property website. Google will win people with this solution for one simple reason. Speed. It’s so quick. There’s no loading time, no waiting around for websites to respond and irritating circles appearing whilst requests are processed. But what does it mean for the hotel industry? In my opinion, if this product is launched globally as Google intend, it could well create a level playing field for OTA’s and hoteliers alike to win business. 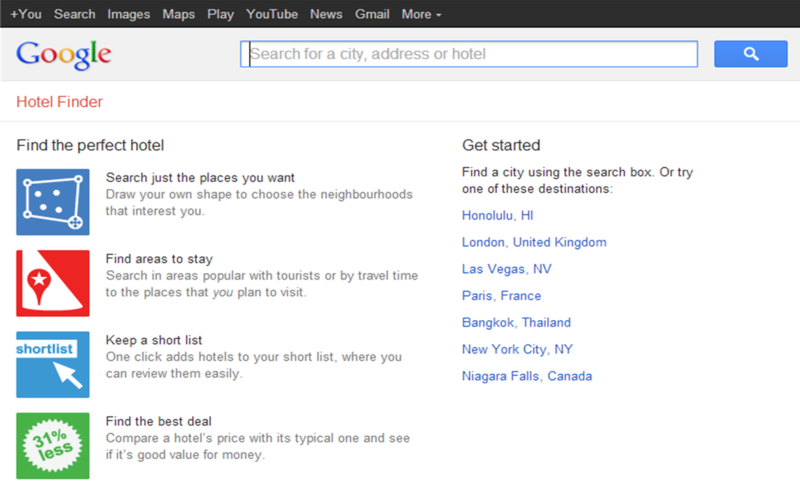 Essentially, your being sold the hotel by search with Google. Then it’s down to price – if the properties own website price is cheapest, you’ll book there. If it’s Booking.com, you’ll go there. 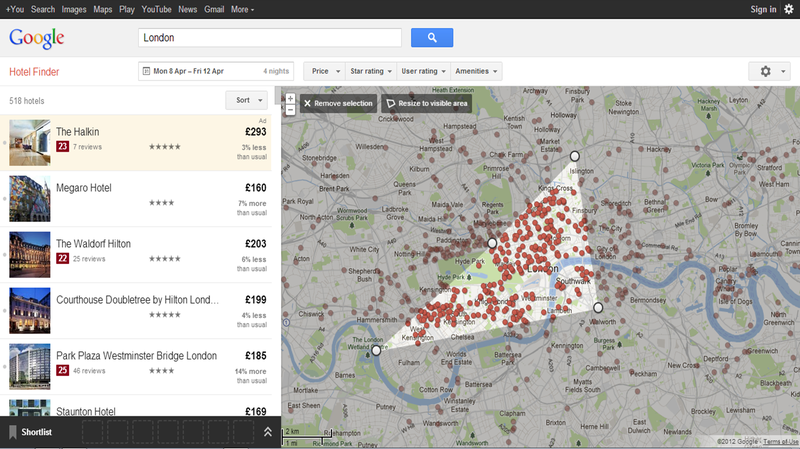 In simple terms, I think a mass adoption of Google Hotel Finder could bring rate parity back in line. 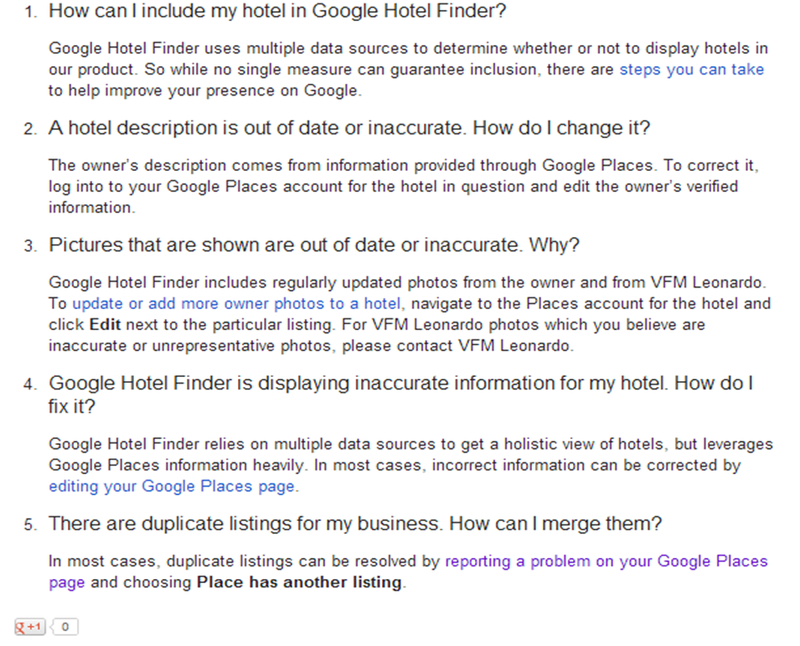 Of course there are many unanswered questions, for instance, how do you get your hotel listed? I can’t see how you do this yet, but imagine Google have plugged in various CRS providers to push the content, people such as Pegasus, Utell and the other representation companies (I would think bypassing GDS). Of course, when the product moves from “experiment” mode, we’ll find out more. Certainly one to watch and it could have major impacts on the hotel industry – but very impressed already.